Supa Nova Slom is known as hip-hop’s medicine man and has helped some of the biggest names in music to restore their health. He was raised in the hood by his vegetarian mother who taught him about the health benefits of foods such as wheatgrass, sprouts, and fresh vegetable juices. In his program, The Remedy, he educates readers about important health factors including leafy green vegetables, detoxification, water, sunlight and exercise. This two-part health guide presents this information in an accessible and practical format that will put you on the path to real weight loss and amazing energy through following an optimally healthy lifestyle. In the first part of the program Supa Nova introduces readers to his “Clorophyllian Cleanse”, which has the effect of detoxifying the body. You will undertake a five-day fast on fresh juices and his combination of “supa mega greens” that flushes and nourishes your cells simultaneously. Watching TV is not allowed during this time so that you have the opportunity to revive your mind as well as your body. The second part of the program involves his Five Week Power Plan, which is designed to guide you through the transition from eating what he calls “the toxitarian diet” to becoming a conscious eater. Week one involves a flexitarian eating plan where you are permitted to eat some chicken and fish but must go without red meat and sugar. In week two you start eating a vegetarian diet, ideally with 50-75% of your diet consisting of raw food. In week three you become a “supa raw food vegan” and in week four you do a juice fast. Week five of The Remedy is where you find your own rhythm – what works for you – based on your experience during the previous four weeks. Even though Supa Nova practices and advocates a raw food diet with a high intake of greens he doesn’t require that you eliminate all of your favorite foods. Instead he encourages you to increase your awareness about the effects that poor eating habits can have on your wellbeing and offers an alternative approach. The entire five-week Remedy program includes daily meal plans and recipes for vegan foods (both raw and cooked). Additionally recipes are provided for juices that are designed specifically for cleansing and healing with body such as Immune Booster, Kidney Cleanser, Blood Builder and Lymphatic Flush Juice. Fresh fruit and vegetables, fresh vegetable juices, spirulina, chlorella, wheatgrass, raw nuts and seeds, avocado, legumes, whole grains, whole wheat bread, herbal tea. The following is an example of the meal plan for week two (vegetarian). The Remedy includes The Five-Week Supa Power Plan, which is a detailed exercise plan with a combination of stretching, cardiovascular and toning exercises. 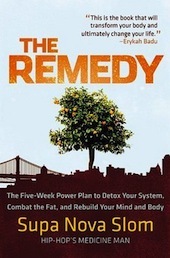 The Remedy: The Five-Week Power Plan to Detox Your System, Combat the Fat, and Rebuild Your Mind and Body retails at $14.99. Encourages a high intake of fresh fruit and vegetables. Can assist to promote detoxification and cleansing of the body. May improve a variety of chronic health conditions. Emphasizes a healthy lifestyle rather than simply losing weight. Includes a five-week meal plan with recipes. Provides maintenance guidelines that can be adapted to suit the individual. Provides a detailed exercise plan that progressively increases in intensity to allow for a gradual adjustment to physical activity. Most dieters will experience detoxification symptoms such as headache, muscle and joint pain or fatigue during the juice fast. Will require more time to be spent on shopping for food and preparing meals and fresh juices. Requires a juicer to follow the program as directed. The Remedy introduces readers to the benefits of a healthy diet with an emphasis on a high intake of raw foods and green juices. It includes a five-day cleanse and a five-week program that allows for a gradual adjustment from a standard way of eating to a raw vegan diet. The goal is that by undertaking the five-week Remedy program you will gain an increased awareness about how your food choices affect your health. However, ultimately readers are given the power to make their own decisions regarding the way of eating that best suits them as a lifestyle approach to healthy eating.